Funny how we shift in November so easily into making Christmas cards. 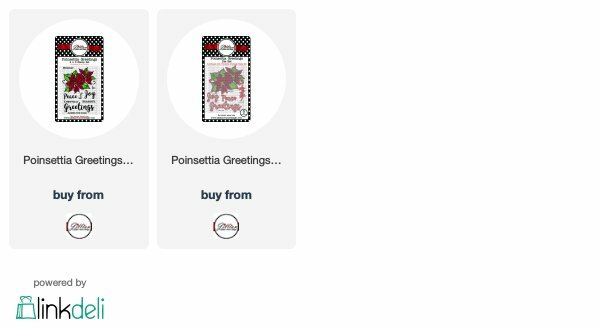 Today I used the gorgeous Poinsettia Greetings Stamp Set to make an easy watercoloured card! The big poinsettia image was stamped and clear embossed with VersaFine Onyx Black Ink on to watercolour paper. The image was watercoloured using Distress Oxide inks in Candied Apple, Fossilized Amber, Peeled Paint and Mowed Lawn. I just smooshed some ink on to my craft mat and then picked up the colour using a small wet paintbrush. For quick drying I hit it with my heat tool--I just love the soft chalky look of the dried Distress Oxide Inks. Watercolouring inside the wells that form when you emboss makes it less likely that you will jump the wall and muddy your paint! The sentiment from the Poinsettia Greetings Die Set was cut with gold foil cardstock and adhered to the card base. The whole panel was attached to the card base with foam tape. Tracey, this card is so simple but so beautiful! This is CAS elegance Tracey, very pretty!